While we supported the recent Asteroid Day event, etc., etc., none of our many efforts to reach the promoters resulted in any responses. Now that mass extinction is becoming a trendy topic, perhaps the promoters would do something really significant and publicize Billy Meier’s warnings about asteroid Apophis, aka the Red Meteor, from 1981 and 2008. The party may be over but Apophis is still coming. Since Meier’s contacts with the Plejaren extraterrestrial human race – now spanning more than 73 years – also happen to be the most important true story in all of science and human history, it should at least be noteworthy for any real scientists involved. Adding to the urgency is the fact that there’s a new global map of where asteroids are most likely to hit the Earth and, wouldn’t you know it, the major line goes from Spain to Scandinavia…including through the North Sea, in the area where the Plejaren said that Apophis will hit, with certainty, if a serious international scientific effort to deflect it with a nuclear charge – as NASA seems to have suddenly have “discovered” – isn’t immediately implemented. So, if Asteroid Day was more than just a trendy, profit-oriented exercise in marketing a film and T-shirts – and I hope I’m not being either unfair or rhetorical – perhaps Greg, Bryan and all the various sirs and stars, etc., will stop patting themselves on the back, wake up and get on with it! They’ve come right up to the brink of doing something of unique historical significance, if they have the wit and the will to do so. The most important incentive may be that they also live not too far from where Apophis will crash down…and alter the face of the Earth and all life on it. And that won’t be anything to party about. Thanks to Nicolas Weis for the map. Thank you for your efforts to alert the world about this danger. I feel that tracking measurements that are currently being used are not including the gravitational pull of Venus during the two orbit crossings that will happen in 2016.
this info last updated: July 21st, 2005. So they are displaying data 10 years out of date and up to 40,000 km off, with no mention of 2036. 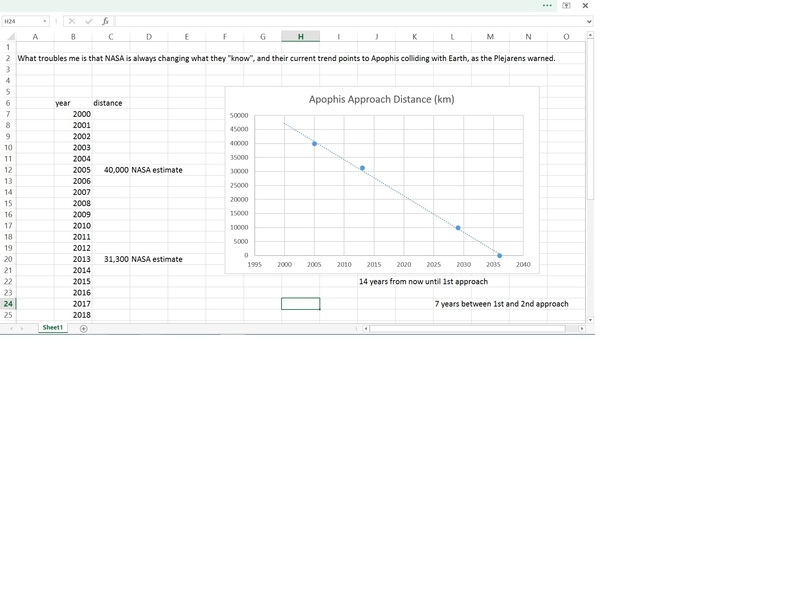 Here is a happy little line graph I made based on NASA’s first two approach distance estimates (their data), and then a hypothetical 10,000 km approach in 2029 and 0km approach in 2036.. This is a keen observation and not insignificant either astronomically or astrologically. The Aztec calendar payed close attention to the Venus-cycle and the related (Uto-Aztecan-speaking) Hopi prophesied that the final “sign of the end of the fourth world” was the coming of a large meteor. The “Blue Star Katsina” has already “taken off his mask before uninitiated children”, so this is now a certain prediction and not just a prophecy (in the sense defined by Billy). You cna also use the search feature on the site to see if there are blogs more related to a specific topic, etc.